A feature of significant hurricanes is the eyewall replacement cycle. Basically what occurs is that a new eye begins to develop around the old eye. The new eye gradually decreases in diameter and replaces the old eye. With the profound increase in the number of extreme hurricanes the past few years there has been an opportunity to witness several eyewall replacement cycles. When an eyewall replacement cycle occurs the intensity of the hurricane usually decreases. For example, a CAT 5 hurricane could weaken to a CAT 4 hurricane. The intensity weakens due to the gradual erosion of the inner eyewall. As the outer eyewall contracts and gains organization then the storm will often increase in intensity. Because of eyewall replacement cycles, a hurricane will typically not remain a CAT 5 for a long period of time. Although an eyewall replacement cycle tends to reduce the category of a hurricane it also spread the hurricane force winds out over a larger area. This can cause a larger region to experience the extreme damage in a hurricane. The forecast models have extreme difficulty with predicting an eyewall replacement cycle. Replacement cycles will usually happen with intense hurricanes but it is not known exactly when. 1. When the eye diameter gets too small then the eyewall convection is not able to stay organized. New convection and a new eyewall develop outside the old one where there is more space and energy. 2. Once the winds become too strong, turbulent breakdown occurs. This turbulence breaks apart portions of the eyewall which lead to its weakening. A new eyewall develops where the wind field remains less turbulent and more organized outside the old eyewall. 3. The band of convection outside the inner eyewall begins to rob the inner eyewall of moisture and energy. The inner eyewall weakens and the outer eyewall, which has greater moisture and energy, replaces it. Here is an example of an eyewall replacement cycle. 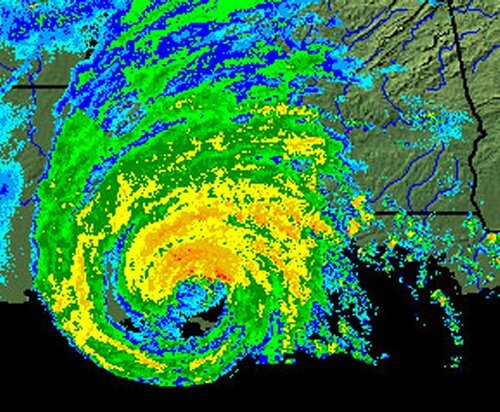 This radar image is of Hurricane Katrina in 2005 that struck the coast of Southeast Louisiana and Mississippi. Notice the circular blue color in the center. That is the eye of Katrina. Notice to the southeast of the eye is a clear area. Notice there is a second eye around the inner eye and the clear area. The inner eye is on the north end of the outer eye. That second outer eye was in the process of replacing the inner eye when Katrina made landfall.